Have you heard of the Golden Cross signal? If you listen to the media, you’ll hear about the Golden Cross (like how the market is bullish when it occurs). Well, that’s what you’ll learn today. What is a Golden Cross and how does it work? The Golden Cross is a bullish phenomenon when the 50-day moving average crosses above the 200-day moving average. When the market is in a long-term downtrend, the 50-day moving average is below the 200-day moving average. However, no downtrend lasts forever. So, when a new uptrend begins, the 50-day moving average must cross above the 200-day moving average — and that’s known as the Golden Cross. Pro Tip: The opposite is the Death Cross — when the 50-day moving average crosses below the 200-day moving average. 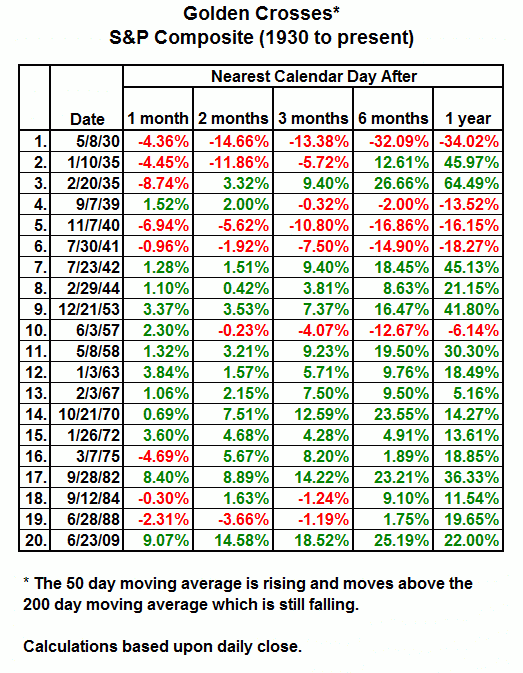 Is there anything magical about the 50 and 200-day moving average? There’s no magic to it. You can use the 49-period and 199-period for all you want and it will not matter. Because the concept is what matters (which is the short-term trend showing signs of strength against the long-term downtrend). The moving average is only a tool to define the trend. Let’s go long when the 50MA crosses above the 200MA and sell when it crosses below — and make a ton of money! Well, not so fast my young padawan. Because in a range market, the Golden Cross will cause many losses (otherwise known as a whipsaw). Unless you know what you’re doing, I don’t suggest “blindly” trading the Golden Cross. Instead, there are better ways to trade it and I’ll tell you more in the next section. If you’re the type of trader who always can’t seem to decide whether you should be long or short, then this trading technique is for you. Because the Golden Cross can act as a trend filter so you can trade on the right side of the markets (and increase your winning rate). If the 50MA crosses above the 200MA, then you’ll look to long only. Or if the 50MA crosses below the 200MA, then you’ll look to short only. It doesn’t mean go long immediately when the 50MA cuts above the 200MA. Instead, it means you have the “permission” to look for long trading opportunities when the 50MA cuts above the 200MA — a big difference. If a Golden Cross occurs, then you can look for bullish trading setup like a Flag Pattern, False Break, Triangles, etc (which I’ll cover more later). Earlier, the examples used were for the Forex and Futures market. But for stocks, it’s different. Because individual stocks are “influenced” by its respective stock index. Yangzijiang would be affected by what STI is doing rather than S&P 500. In essence, if the index is bullish, then chances are the stock will move higher. So how do you apply the Golden Cross to stock trading? You overlay the Golden Cross to the stock index. If a Golden Cross occurs on the S&P 500, then it means you want to be bullish on stocks within the S&P 500 index. But does the Golden Cross really work? This shows the returns after 1 month, 2 months, 3 months, 6 months, and 1 year after the Golden Cross occurs on the S&P. Clearly, the Golden Cross has a positive bias, and the market is likely to head higher after it occurs. And in the next section, you’ll learn how to better time your entry when trading the Golden Cross. Now, you don’t want to go long just because you spot a Golden Cross. Because you could be entering when the market is “overextended” — and about to reverse lower. You can use multiple timeframes to better time your entry. The beauty of this method is you’ll have a better entry, tighter stop loss and a more favorable risk to reward. But the downside is you might miss the move if can’t find a valid trading setup. If you want to ride massive trends in the market, you cannot have a target profit. Because a target profit limits your profit potential? You must trail your stop loss. This means as the market moves in your favor, you’ll “lock in” your gains but still give your trade room to breathe — should the price moves further in your favor. And one way to go about it is using the Golden Cross as a trailing stop loss. If you’re in a long trade and the market moves in your favor, then you’ll hold the trade till the 50-day crosses below the 200-day Moving Average. A trailing stop loss is not easy to execute. Because often, your winners will become losers as you try to ride the trend — and that’s the price you must pay. How do you use the Golden Cross in your trading? Leave a comment below and share your thoughts with me.